Villa La Estancia - Book a fabulous 5 star resort and enjoy paradise ! **IF this villa is booked during your desired dates please look at our other villa VRBO#20081** Villa La Estancia has the only privately-owned condominiums on the fabulous Medano Beach of Cabo San Lucas. We offer a garden view, two-bedroom, three bath condo with all the amenities of a five star hotel, but all the comforts of home. 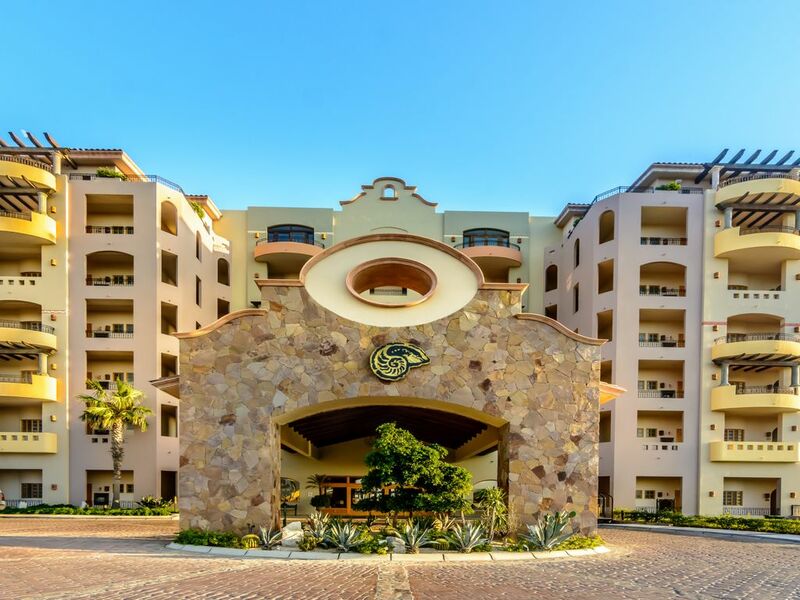 Villa La Estancia offers a 24 hour front desk concierge service, 24 hour security, pool-side restaurants, a beautiful fitness center, and spectacular ocean view swimming Jacuzzi and pools. Guests also have signing privileges at two adjacent resorts - Villa Del Arco and Villa De Palmar, which includes additional restaurants, a children's program, two full service European spas, and a fitness center with private classes. The facility also features a supermarket, deli, ice cream parlor, internet cafe, video rental, pharmacy gift stores. We have a ground floor garden view condo that can accommodate two-six people. The unit can be rented as a two-bedroom three-bath or can be rented as a single bedroom with 1 bath. The condo is spacious and elegant, with 2200 square feet of living space. It is a complete luxury residence, with marble floors throughout. The condo has a full kitchen which include a washer and dryer area, breakfast bar, dining room, and living room. The master bedroom has a king-size bed and a sitting area, and the master bath has a Jacuzzi tub, shower, and double sinks. The second bedroom has a bathroom and two queen-size beds. There is cable TV, DVD and stereo system in each room including the living room. Cabo offer's world class fishing, snorkeling, diving, and golf. Some of the world's best golf courses are a short drive from the resort. Town restaurants, shopping, and nightlife are a ten minute walk along the beach or a short cab ride away. There is no place like Cabo and no better way to enjoy it than at Your Home By the Sea at La Estancia! To book your Cabo vacation now, send us an email to check the availability for your dates of travel. Also we will work with you on the minimum night stays as there are frequently times where there are openings that fall below the minimum requirements, just email us! Gary and I have been coming to Cabo for 25 years and we absolutely love it. We love Cabo so much we got married on the beach in front of 'Villa La Estancia' at sunset. We had the most beautiful wedding ever. We live in Cabo 6 months out of the year (winter) and if we had our way we would live here permanately. Location Location Location! Cabo is one of the most beautiful places in Mexico/BCS. Medano beach is the most magnificent beach on the entire Baja Peninsula and needless to say Cabo has the best weather in ALL of Mexico. We love Cabo so much we wanted other people to see and feel the same joy and beauty as we have. Cabo has many things to offer...wonderful weather, exquisite beaches, fabulous fishing (Bisbee fishing tournament), pro golf courses, atving on the beach or mountains/waterfalls, ziplining, snorkeling/scuba diving, swimming with the dophins and many great restaurants. Google phone which allows you to make free calls anywhere back into the United States and Canada. The privately owned villa includes 3 phones, check-in reception, 24-hour security, concierge, business center. You can also enjoy an on-site super market, deli, ice cream store, Video rental, internet cafe, pharmacy, two full service European spas, the larges work-out facility in Cabo with schedules classes, sauna and steam room. The villa also offers many ocean view Jacuzzi's and spectacular ocean view restaurants.